A Cascadia Subduction Zone earthquake would change all aspects of life as we know it, including running water and flushing toilets. Most people in this part of the world have no experience living without water and sewer service, and many would not know how to maintain adequate hygiene practices. When pipes break across the region, we could see a secondary disaster affecting public health and the environment. The RDPO’s multi-disciplinary and multi-jurisdictional Regional Disaster Sanitation Task Force is addressing this issue. The task force is comprised of representatives from public health, public works, waste removal, environmental sustainability, and emergency management. The Disaster Sanitation Task Force has created recommendations for public messaging (www.emergencytoilet.org). One of the recommendations is to use the Twin Bucket method, which instructs people to contain their feces in heavy-duty garbage bags until public agencies can provide further guidance. The Task Force is now developing recommendations for jurisdictions on how to collect, transport, and dispose of bagged feces. Join us on March 5, 2019 from 8am-12pm at the Oregon Convention Center to discuss these recommendations. Breakfast will be provided, thanks to the generosity of Metro. Sue Langston from Oregon DEQ will facilitate. Pre-registration is required. History of the project. Task Force members from various disciplines will explain what was considered and how they landed on the current recommendations. Topical breakout sessions. Gather input on the recommendations (fix errors, add data, rank options based on feasibility, address regulatory barriers). Create a dissemination plan. Who else needs to get this information? How can attendees help with dissemination? How can we plan for those who will be most heavily impacted? Everyone who has participated in the Task Force thus far should attend. If you know of anyone else who should be part of this discussion, please extend the invitation to them. We may need to cap attendance if we reach capacity. If you want to attend, please complete this Registration Form. In February, we’ll send out more info about the event, including the current recommendations and a packet of read-ahead materials. Several recent disasters in the United States have caused damage to portions of water and wastewater systems, leaving major metropolitan areas without access to clean water and flushable toilets for prolonged periods. Emergency managers, among others, have recognized a need to improve post-disaster sanitation management and educate communities on how best to manage human waste. In 2016, Sue Mohnkern of Washington County Public Health (in Oregon) led the Regional Disaster Sanitation Task Force in developing guidelines for disaster sanitation following a catastrophic, pipe-breaking event. In 2017, the technical content created by the sanitation task force was passed to the RDPO’s Regional Disaster Preparedness Messaging Task Force. 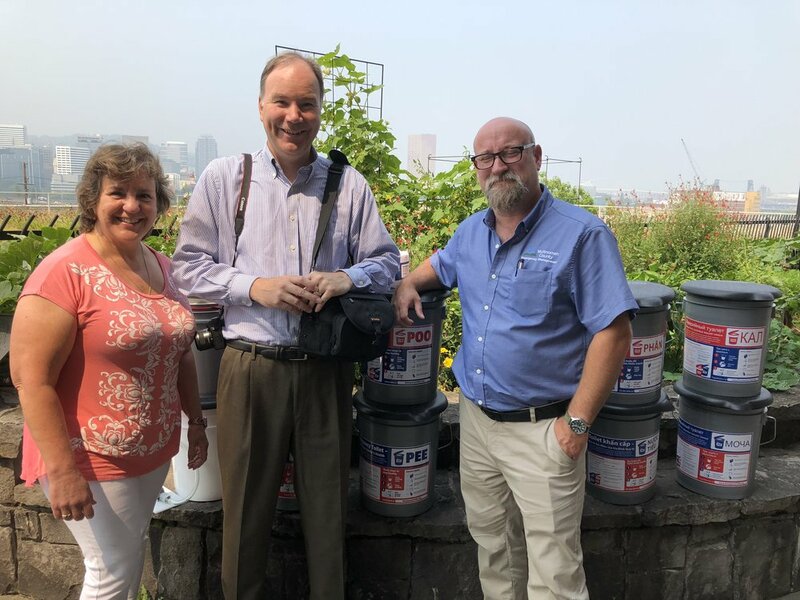 With the help of an Urban Areas Security Initiative (UASI) grant, they hired Portland-based consulting firm Barney and Worth to help transform the disaster sanitation guidelines into pre- and post- event education campaign tools, which can be found on the Emergency Toilet Project web page. In 2018, the Regional Disaster Sanitation Task Force convened again to complete the project. They are currently meeting to create recommendations for local jurisdictions on how to collect, transport, and dispose of human feces as soon as systems begin to function. The recommendations will include multiple options so they can make informed decisions based on the options available to them.